LOUISVILLE, Ky. — Louisville entered the 2015 season with plenty of quarterbacks, but the Cardinals were struggling to find a punt returner. True freshman QB Lamar Jackson’s athleticism was so tantalizing, and the need for a dynamic returner so urgent, that someone on the coaching staff asked him to go field a punt and see what happens. Seemingly minutes after practice had ended, members of the coaching staff got a call from Jackson’s mother, Felicia Jones. Head coach Bobby Petrino had lured Jackson to the Bluegrass State with the assurance that the freshman would be a quarterback and only a quarterback. Punt returner doesn’t look like quarterback, Jones said. She reminded them all of the promise Petrino had made to her and her son while sitting on a couch in their South Florida home. Jackson never went back for a punt return in practice again. Jackson is arguably the most unique and perplexing prospect in this year’s draft. Few quarterbacks in any class can match his athletic ability, yet he’s solidly fifth in this crop, according to most projections. There have been calls to move him to wide receiver, echoing the ugliness of how talented black quarterbacks have been treated by football’s white decision-makers throughout the sport’s history. 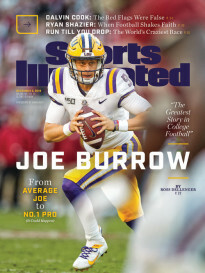 And there’s the business side of it for Jackson, entering a multibillion-dollar league without the guidance of an experienced agent, something that almost never happens for a potential first-round quarterback. His mother is his manager, though no one really knows what that means. Is she a helicopter parent, or is she simply steering a ship that’s being carried by the current? Did she tell him not to run the 40 or do agility drills, and if so, why? Why is she easier to reach for some teams than for others? To a man, in interviews with people who have known Jackson and his mother since he was a teenager, everyone says Felicia Jones has her son’s best interests at heart. Clearly those interests are to ensure that he’s a starting NFL quarterback, a path they’ve traveled together for years. He began his high school career at Santaluces High in Lantana, Fla., about 60 miles north of Miami on Florida’s east coast, but left at some point after his freshman year. One person interviewed for this story thought it was because he wasn’t guaranteed the starting quarterback role and was splitting time. Jackson transferred to nearby Boynton Beach. When you play high school football in South Florida, it’s almost a rite of passage to transfer schools at least once. Whatever the reason, “it was a gift from the football gods” for Rick Swain. The head coach at Boynton Beach had been running the Wing-T shotgun for the better part of two decades when Jackson transferred in. Jackson had done some passing drills before spring ball and looked good, but Swain had a converted wide receiver whom he had been grooming to take over at quarterback. He put in an option play for Jackson on the first day of spring practice, and Jackson read the end, stuck his foot in the ground, turned north and went 60 yards untouched. And thus, for the first time, a coach tailored his offense for Lamar Jackson. Swain had never been a subscriber to the philosophy that you put your best athlete at quarterback. Jackson changed that. Boynton Beach went to the pistol with four wideouts as its base; occasionally a tight end would be used. The idea was simple: spread out the defense and let Jackson shred it. Once, Swain caught a wild hair and wanted to use his best athlete as a safety in obvious passing downs and Hail Mary situations, hardly an unusual strategy. But just as with the punt return a few years later, it never happened. But many did think he was something else, even if they couldn’t put a finger on it. A three-star recruit, Jackson was sought-after as an athlete by dozens of top colleges, but he was only going where he could play quarterback, and with a realistic chance to start early. Some engineering had to be done. In 2013, Lamar Thomas, the former University of Miami wideout who spent eight seasons in the NFL, was coaching receivers at Western Kentucky under Bobby Petrino. It was Swain, Thomas’s high school coach, who put him on to Jackson. Petrino took the Louisville job in January 2014, and Thomas followed him, continuing to recruit Jackson. He had a tough time selling his boss on the quarterback’s tape, though, so he came up with a different approach. Swain changed the film and posted a new highlight tape to Hudl. Thomas sat down with Petrino in the offensive meeting room. Have you told me about this kid before? Can we get this kid? Thomas had to sell momma first, though. Louisville had to promise that Jackson would be a quarterback-only. The first time Thomas met Felicia Jones, he did all the talking, and she stared at him without saying a word. He says they laugh about that now. Thomas’s word wasn’t enough, however. Jones needed to hear it from Petrino. So the coach walked into her home and promised that her son would play quarterback-only and have a chance for significant playing time as a true freshman. Jackson was on his way to joining the Cardinals. Jackson’s first fall camp at Louisville played out just like his first spring practice at Boynton Beach. He was competing with Reggie Bonnafon and Kyle Bolin, both of whom had started games the previous season. The Cardinals put a read-option play in for Jackson, who read the end perfectly, stuck his foot in the ground and went north for a 75-yard touchdown. Bonnafon won the right to start against Auburn in the Chick-fil-A Kickoff Game, but Jackson got the first pass attempt of the season when Petrino dialed up a trick play on the first play from scrimmage. Jackson rolled right, away from pressure, and threw a prayer near the sideline into double coverage. Interception. As Petrino wove a tapestry of obscenities over the headset to his offensive coaches, Thomas went over to Jackson on the bench, put his hands on the young quarterback’s shoulders and told him to forget about it. Louisville, a double-digit underdog to the sixth-ranked Tigers, was down 14-0 midway through the second quarter when Petrino put Jackson back in the game, this time at quarterback. He led three second-half touchdown drives—rushing for 106 yards and throwing for 100—and Louisville nearly finished the comeback in a 31-24 loss. The Cardinals played musical chairs at the position until the regular-season finale at Kentucky. After a Bolin pick-six put UK up 21-0 midway through the first quarter, Petrino pulled his starter. Again, Thomas went over to his prized recruit on the bench. Jackson would account for 316 yards of total offense and three touchdowns in a 38-24 win. He never relinquished the job. During that freshman year Jackson roomed with receiver Jaylen Smith, who went on to become his favorite target last season. After games, Jackson would put his mom on speakerphone, and she would offer critiques of the roommates’ performances. 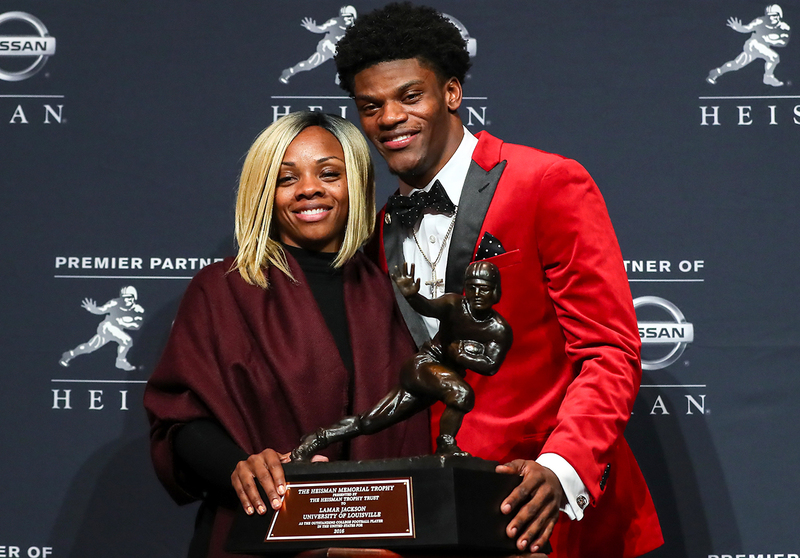 Jackson and his mother, Felicia Jones, at the 2016 Heisman ceremony. Jackson’s sophomore year is now legend. He passed for 3,543 yards, with 30 touchdowns and nine interceptions, and rushed for 1,571 yards and 21 TDs, winning the Heisman with nearly twice as many first-place votes as runner-up Deshaun Watson. Petrino wanted to expand his offense going into Jackson’s junior season, and the quarterback had reached a point in his development where he was able to rely less on his legs. The Cardinals spent the first week of spring ball working him solely under center. The dropback passing game received greater emphasis, and Jackson began the process of widening his narrow throwing base. As the coaches molded him into a better passing quarterback, he got more freedom at the line of scrimmage to make checks. But Jackson didn’t get the publicity typically afforded to a reigning Heisman winner. Throughout the fall, as his numbers began to eclipse those of his sophomore season, Jackson often remained an afterthought in the national conversation. He has been mostly quiet since he left Louisville, doing a group interview at the NFL scouting combine last month and a couple hits with ESPN. In that combine interview he said his mother was his manager but not his agent, that he will not hire an agent, and that he will use a lawyer to look over his rookie contract. 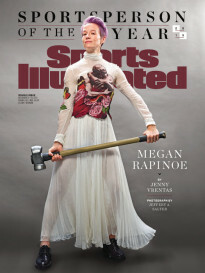 Jones has kept her silence, just as she did throughout Jackson’s collegiate career. She declined multiple interview requests from The MMQB over the past two months. For these two, mum’s the word. • SAM DARNOLD’S PODCAST LIFE: What the quarterback was doing off-the-field at USC. The entire pre-draft process has been unique for Jackson. A potential first-round pick, he’s met with the Texans (who have Deshaun Watson and don’t choose until the third round) and the Chargers and, according to ESPN, has a private workout with the hometown Dolphins. At this point, it’s unclear which other teams, if any, Jackson has met with since the combine. After his pro day workout, Jackson spoke to former Heisman winner Andre Ware of ESPN, before going to NFL Network’s Mike Mayock for a four-minute sit down. Both of those interviews were approved by Jones, who did not O.K. Jackson taking questions from other media in attendance, as is the custom at pro days. It’s also unclear if Jackson has an apparel endorser. Again, most players of his caliber would be suited and booted by Nike, Adidas or Under Armour by now, their social media pages awash with corporate thank-yous for the easy check. At his pro day, Jackson wore a school-issued Adidas top and shorts, then slipped off his Gucci sandals before his workout to don orange-and-silver Nike cleats. Joshua Harris has been coaching Jackson since the quarterback left Louisville. Harris is a high school coach in South Florida who reportedly played college football at Miami before transferring to Tennessee State. He scripted a pro day workout that saw Jackson get under center for all 59 of his throws, and Jackson worked with his receivers in Louisville for the three days before last Thursday’s big day. Felicia Jones was there for the practices. Jackson looked great throwing the ball, better than the numbers (47-for-59) would suggest. Of his 12 misses, eight were drops and one was a wide receiver slip. He was inaccurate on just three throws. Harris directed Jackson, and the coach was flanked by two friends of Jackson’s family, though no one in Jackson’s camp or from Louisville would or could divulge their names. The Super 8 team gathered their belongings and headed to the exit of the indoor practice facility. Waiting outside was Chargers offensive coordinator Ken Whisenhunt and quarterbacks coach Shane Steichen. In Philip Rivers, the Chargers have an aging franchise quarterback, and coach Anthony Lynn gushed about Jackson’s playmaking ability at the combine. The team wanted to meet with Jackson.